3.12 March 2, 2009: Thousands gather to protest coal and global warming, Washington, D.C.
3.66 October 30, 2009: Activists protest mountaintop removal at EPA offices throughout the U.S. Nonviolent direct action - a term which, in contemporary social movements, is usually used to refer to acts of civil disobedience, in which activists blockade or occupy public or private space - has become an increasingly common tactic of anti-coal climate activists since 2005. While Greenpeace has used direct action tactics since the 1970's, since 2004 other climate justice, Appalachian environmental justice and anti-mountaintop removal movements (such as Rising Tide, Rainforest Action Network, Earth First!, Mountain Justice Summer, and indigenous groups) have used direct action tactics in order to escalate pressure on coal mining and power companies, financial institutions which invest in coal companies, and government officials that support the coal industry. Anti-coal activists have staged dozens of such direct actions in the past few years, many of which have been highly successful at directing public attention toward the growing anti-coal movement. Five Coal River Mountain activists were arrested and charged with trespassing after locking themselves to a bulldozer and a backhoe at a Massey Energy mountaintop removal site. The activists planted a banner for the Coal River Wind Project in protest of the impending 6,600 acre mountaintop removal strip mine. 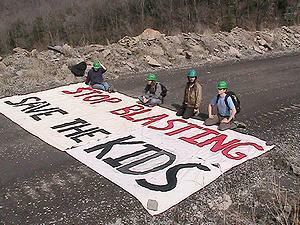 Later in the day, eight more activists were arrested during a demonstration against Massey Energy's preparations to blast the mountain. Environmentalists contend that the mountain is better developed for a wind energy project, and that the blasting could destabilize the world's largest toxic coal slurry impoundment. Rising Tide Boston crashes Arch Coal CEO lecture on February 5, 2009. About two dozen people identifying themselves "Billionaires for Coal" gathered outside the headquarters of Dominion to lampoon the coal industry. The activists wore formal dress and sipped from wine glasses, while shouting pro-coal, anti-environment slogans including "Up with sea levels, up with profits." A bluegrass band also performed, calling themselves "The We Love Money String Band". Although the group's signs and chants stayed on message with the billionaire façade, the activists distributed leaflets revealing that the demonstration was organized by Blue Ridge Earth First! On February 6, so-called "progressive" radio host Ed Schultz allowed Joe Lucas, Senior Vice President of Communications for the American Coalition for Clean Coal Electricity, unchallenged air time to promote coal industry propaganda. After three and a half hours of grassroots pressure through emails and phone calls, Schultz opened the topic of "clean coal" on his show and invited an "anti-coal" guest on his show. Schultz is admittedly pro-coal, but he acknowledged the pressure he was under to provide the other side of the story. Hundreds gather for coal protest in Frankfurt, KY on Feb. 17, 2009. Hundreds of activists from ILoveMountains and Kentuckians for the Commonwealth, as well as actress Ashley Judd, gathered outside the state capitol building to protest mountaintop removal mining and rally for proposed legislation that been stuck for several years in the House Natural Resources and Environment Committee. The bill, sponsored by Rep. Don Pasley, D-Winchester, would prohibit mining operations from dumping refuse into adjacent streams, but coal interests in the legislature have managed to keep the bill from getting a vote on the floor. Over 200 citizens wearing respirators marched along the Corpus Christi bay front to protest the proposed Las Brisas Energy Center. The marchers included local doctors, who warned that the plant would worsen asthma rates, heart attacks, cancer, neurological and behavioral problems, and failed births. Estimates suggest that the plant would produce over 21000 tons of air pollution a year, more than the annual emissions of all the surrounding counties combined. Citizens across Massachusettes rallied outside of the state's three major coal plants to show support for the March 2nd Capitol Plant protest in Washington, DC. The largest demonstration was in Somerset, MA, where residents gathered to protest the Somerset plant. Groups also convened in Holyoke and Salem Harbor, MA. March 2, 2009: Thousands gather to protest coal and global warming, Washington, D.C. In the largest protest yet against global warming, several thousand demonstrators convened outside the Capitol Power Plant, calling on Congress to pass legislation to reduce greenhouse gases. Around 2,500 people blockaded the gates to the plant. No arrests were made. Just days before the planned protest, Speaker of the House Nancy Pelosi and Senate Majority Leader Harry Reid announced the plant would be taken off coal and switched to natural gas. The announcement was viewed by many as a victory for grassroots activism, but the rally went forward to call attention to coal issues around the country. Also on March 2, organizers of the Power Shift 2009 conference spearheaded a grassroots lobbying drive described as "the biggest lobbying day on climate and energy" in the history of the U.S., with approximately 4,000 students visiting almost every congressional office. United Mountain Defense volunteer staff person Matt Landon was arrested while driving a blind grandmother home after a public meeting through an unstaffed illegal TVA roadblock following the TVA Kingston Fossil Plant coal ash spill on December 22, 2008. Over 200 Kansas residents rallied on Statehouse grounds to protest legislation that would resurrect two coal plants proposed for Western Kansas. The group included environmentalists opposed to coal, steelworkers pushing to build wind turbines, rural advocacy groups, and a Christian minister. Bill 2182 would strip the Health Secretary and the Department of Health and the Environment of their power to regulate industry based on air quality concerns. The bill has passed both the House and the Senate, but the Governor has promised to veto the measure in its current form. Members of Mountain Justice and Earth First! from Florida and Appalachia disrupted the lobby of a Bank of America branch in Sarasota in protest of the Bank's continued funding of mountaintop removal mining and the construction of new coal-fired power plants despite recent claims of environmental concern. While several folks distributed informational hand-outs about BoA's investments in coal to tellers and account-holders, one individual played bluegrass banjo to celebrate the culture of the Appalachian region that BoA's investments so threaten. The activists' signs read, "Bank of America: still funding coal, killing communities." Rally outside Texas capitol building on March 30, 2009. Student activists from ReEnergize Texas gathered at the capitol to rally for clean energy projects and green jobs. Members of the state legislature were also in attendance. The group expressed support for proposed legislation that would enact a temporary moratorium on coal plants without carbon capture and sequestration. After the rally, the activists visited 75 legislative offices to lobby for the bill. 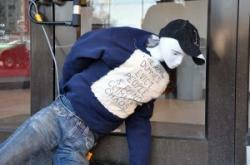 Activist with Mannequins for Climate Justice shuts down B of A branch in Boston, MA on Mar. 31, 2009. Police carried out what may be the largest preemptive strike on environmental activism in British history. 114 people were arrested for planning a direct action at a coal-fired power station, believed to be E.ON's Ratcliff-on-Soar plant. Caroline Lucas, leader of the Green party, said, "confidence in policing of protests like this has just about hit rock bottom. Peaceful protest is a civil liberty we need to be upheld, even more in the context of the lack of government action on climate change. We have tried all the usual channels." The alleged activists were charged with conspiracy to commit criminal damage and aggravated trespass. E.ON confirmed that the Ratcliff plant was the intended target. No group claimed responsibility for the alleged protest. Although no details of the proposed action were available, veteran activists suggested that demonstrators may have planned to chain themselves to conveyor belts transporting coal into the power plant. The tactic has been used at both Ratcliffe and the Kingsnorth Power Station, also owned by E.ON UK. Hundreds of people marched and rallied against Cliffside in Charlotte, NC. The demonstration was organized by more than a dozen environmental, faith-based, and social justice groups, which are calling on Duke Energy and the state of North Carolina to cancel construction of the Cliffside plant. 44 activists were arrested. Greenpeace activists hang banner at international climate meeting in DC on April 27, 2009. More than 200 people from 30 states and six countries began fasting for a period of 1 to 40 days, in order to call attention to the need for the United States to demonstrate world leadership on climate change. The Fast For Our Future action is calling for legislation mandating a 25 to 40 percent or higher decrease in greenhouse gas emissions over 1990 levels; a moratorium on building new coal-fired power plants; and strong climate legislation that contains no giveaways to polluters. Activists from Greenpeace USA hung a huge banner from a crane across the street from the State Department to urge action from Ministers of the 17 largest global emitters. The ministers are in DC to discuss climate change as part of the Major Economies Forum. 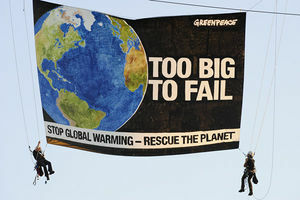 The banner read, "Too Big To Fail: Stop Global Warming - Rescue the Planet." Seven activists were arrested. More than seventy-five residents of the Coal River Valley and members of a coalition that includes Mountain Justice and Climate Ground Zero picketed the entrance to Massey Energy's Marfork Complex. The actions were in protest of the company's plans to blast 100 feet away from the Brushy Fork coal sludge impoundment. The demonstration began with a prayer and sermon by Bob "Sage" Russo of Christians for the Mountains. Referencing the Sermon on the Mount, he called upon citizens to be stewards of the Earth and to move towards sustainable, stable jobs. Protestors stood in front of the gates of the mine facility with signs including "7 billion spilled, 998 killed." "Passersby on Route 3 were overwhelming supportive with honks, waves, and thumbs up signs," Rock Creek (Raleigh County) resident Julia Sendor said. During the protest, seven people approached the entrance to the dam facility and the Whitesville detachment of the West Virginia State Police asked them to leave. When the seven refused, the State Police arrested them. After the arrests, former U.S. Congressman Ken Hechler, a longtime opponent of strip mining, gave a speech. He underscored the responsibility of citizens to safeguard their freedoms and stand up for their rights. The protest came just hours after activists carried out two non-violent direct actions to protest mountaintop removal and coal sludge impoundments. Two people wearing hazmat suits and respirators were arrested after boating onto the Brushy Fork impoundment and floating a banner that read, "No More Toxic Sludge." State Police charged the activists with littering and misdemeanor trespass and transported them to the Southern Regional Jail. Their bail has been set at $2,000. Six people raised a "Never Again" banner and locked themselves to mining equipment at Massey Energy's Patriot Coal mine on Kayford Mountain. State Police arrived on site to find three people chained to the main axle of the truck and three others chained outside the truck's cab. The police removed the six activists, who, along with two others supporting them, were transported to the Madison County Courthouse, where they were reportedly processed and released. The protesters are part of a coalition that includes Mountain Justice, Climate Ground Zero, and concerned citizens. Thousands march against coal plant in Germany on May 23, 2009. Thousands of activists gathered in Mainz to protest an 820-megawatt coal-fired power plant being built on the banks of the Rhine river. The protesters carried banners and marched through the city to display their opposition to the new plant, which is expected to be operational by 2013. The group included local farmers, environmental activists, residents, students, and politicians. Climate change activists, calling themselves the Mainshill Solidarity Camp, erected a treehouse, tunnels and even a hammock that surrounded a site of a proposed opencast coal mine controlled by Scottish Coal. Protester Ross Jones said: "The reaction has been amazing. It was the first of its kind demonstration against coal mining in the country. Protesters stated that it was the beginning of more such actions to follow. Activists took to the streets and blockaded the prime minister's Sydney office protesting the Rudd government's response to climate change. Streets were blocked off as protesters in Sydney marched from the harbour to Kevin Rudd's city office, where they staged a short sit-in protest against the carbon emissions scheme. The rallies attracted about 6,000 people nationwide, and included environmental groups like Greenpeace and the Wilderness Society who want an emissions scheme ditched in favour of an alternative dubbed "Plan B", which includes the phasing out of coal-fired power stations and 100% renewable by 2020. Ten Greenpeace activists boarded a ship delivering coal to the Kingsnorth Power Station. The group used inflatable speedboats to target the boat as it sailed up the River Medway. All 10 protesters were arrested and charged with conspiring to commit criminal damage and having an unauthorized presence on a ship. More than 700 people attended a meeting organized by opponents of a proposed $92.8 million carbon capture and storage project in Ohio. The project would inject carbon dioxide from a nearby ethanol plant more than 3,000 feet underground. The group included local residents, activists, and politicians. A representative of the Ohio Environmental Council commented that he had "rarely seen a community that well organized and that strong." Activists with Rising Tide draped a 25-foot banner reading, “Mountain Top Removal Kills Communities: EPA No New Permits. MountainJustice.org” at the downtown offices of the Environmental Protection Agency. The group is urging the agency to block over 150 pending permits for mountaintop removal coal mining in West Virginia, Kentucky, and Virginia. A group of Greenpeace activists spray-painted the message "G8: Failed" on a ship carrying 25,000 tons of coal bound for the Civitavecchia power station, near Rome. Further south, activists in Brindisi painted "Stupid" on Italy's largest coal plant. The actions were intended to protest the G8 meeting on climate change, which UN official Yvo de Boer described as "disappointing." More than 200 Boulder residents attended a rally opposing Valmont Station. Activists from Greenpeace and Clean Energy Action planned the rally to draw attention to a hearing on renewing Valmont's air permit. Many Boulder residents are pushing for the plant to stop burning coal and switch to cleaner energy. 150 farmers living in Bangun Rejo village, Kutai Kartanegara regency, blocked the road access to coal firm PT Kitadin on Thursday to protest against activities stopping farmers from harvesting. The protesters, who transmigrated from Blitar, East Java, in 1981, said mining activities had caused a build up of sediment in the river, whose water they relied mostly on to irrigate their rice fields. He added the company had promised to help the farmers secure water but the promise never materialized. The protest ended after farmer representatives and the firm agreed to hold talks to settle the issue. Hundreds of individuals gathered at the Michigan State Capitol to rally for the development of wind, solar, and other renewable energy sources instead of building new coal plant projects in the state. The rally was hosted by a coalition of environmental groups, including Clean Water Action, Michigan Interfaith Power and Light, the Michigan Land Use Institute, and Sierra Club. Organizers said they hoped to convince lawmakers to expand investments in the state that support clean, renewable energy. Activists protesting plans for a new mine near Douglas, UK dumped piles of coal outside the headquarters of South Lanarkshire Council. A damaged conveyor belt, which was suspected to be another action by climate change protesters, disrupted coal deliveries at an existing mine in the area. The protesters, organized by the Camp for Climate Action Scotland, said they wanted to call attention to the environmental and health issues of open cast mining. Activists lock down West Virginia DEP on Aug 11, 2009. 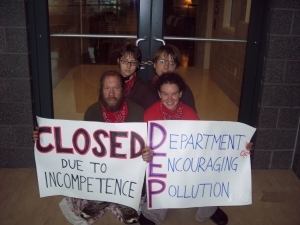 Four protesters locked themselves to the entrance at the West Virginia DEP, displaying signs that read, "Closed Due to Incompetence" and "Department of Encouraging Pollution." The activists demanded that the EPA and Office of Surface Mining, Reclamation, and Enforcement take over of the agency's programs. They also called for Secretary Randy Huffman's resignation. All four protesters were arrested. Approximately 1,500 activists mounted a protest against coal-fired power plants, but they were unable to enter a coal plant they had hoped to shut down by chaining themselves to conveyor belts. Police blocked the protesters from entering Copenhagen's Amagervaerket power station. About 100 people were arrested. Over 50 British Greenpeace activists in October 2009 led a protest on top of the House of Parliament to protest the country's use of coal. The activists that were arrested spent one day in jail. Emma Gibson, one of the protesters involved, stated that her children give her the strength to be involved in such actions against coal. "Having twins changed me enormously. Physically and emotionally it was a very difficult experience," she said. "I felt that if I could survive twins, then I could survive anything." Ten people blockaded the Ravenstruther terminal near Lanark in opposition to five new open pit coal mines in the area and 13 new mines in Scotland. Police said one man was arrested for assault and three women and a man arrested for breach of the peace. Two environmental protesters have been arrested in Brisbane after briefly halting the loading of coal onto a Taiwanese vessel. Police used an angle grinder to cut a metal pipe, freeing the pair and loading resumed after about 45 minutes, the protesters said. Meanwhile, members of the Friends of the Earth group known as Six Degrees took to the Brisbane River in 16 kayaks, vowing to blockade the vessel, Formosabulk No.4, which was loading 90,000 tonnes of Queensland coal for Taiwan. Six Degrees spokesman Brad Smith said the group would continue to protest against Queensland's expanding coal industry. Hundreds of activists gathered to march and rally in front of the Fisk Generating Station in Chicago, IL to observe an international day of action on climate change. In August 2009 the U.S. EPA and the State of Illinois sued Midwest Generation, the owner of Fisk and five other coal plants, charging the company with failing to install pollution control equipment required under the Clean Air Act. At the protest, eight people locked arms and sat down in front of the power plant. All eight were issued citations. Tens of thousands of people gathered at more than 5,200 actions in over 180 countries around the world for the International Day of Climate Action. 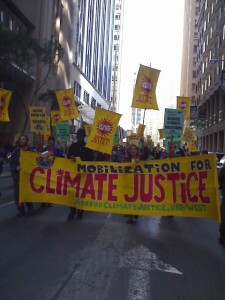 The protests were organized to call attention to the urgent issue of global climate change ahead of the December COP15 meetings in Copenhagen. Actions included climbers holding banners in the mountains of Switzerland, parades of cyclists in Copenhagen, Boulder, and San Francisco, organizers banging gongs and ringing church bells in Papua New Guinea and Barcelona, and thousands of people marching in Bogota and Kathmandu. All protests called attention to the number 350, reflecting the goal of reducing the amount carbon dioxide in the atmosphere below 350 parts per million. To see pictures of the numerous protests, go to 350.org. Over two dozen Greenpeace activists in Sweden dumped 18 tons of coal on outside the country's government offices on October 28, 2009 in protest of the state-run Vattenfall Energy. The company does not own or operate any coal-fired power plants in Sweden but has acquired 12 plants in Germany, Poland, The Netherlands and Denmark. The group of 30 or so activists unfurled a green banner on the facade of the building reading - Reinfeldt Stop Sweden's Coal Plants - and formed a ring around the entrance to the building. No arrests were reported. On October 26, 2009, nine climate change protesters climbed the chimney, and eleven chained themselves to the coal delivery conveyors; the latter group were cut free by police after five hours, but the former waited until October 28 before coming down again — all twenty were arrested, and power supplies continued uninterrupted. The power station was installing improved security fencing at the time. The action was intended to draw attention to the plans of RWE Group to build as many as 30 new coal-fired power stations across Europe, including two in Britain. The group took over a room at the power station and pitched tents on top of a chimney tents. Two specialist climbers entered the chimney flues, intending to remain for a week in order to prevent the plant from restarting; however, after encountering hot conditions, they were unable to stay. At 4 a.m. on October 29, the group voluntarily came down from the chimney and were arrested. The group had met at Climate Camp in London. Two activists locked themselves to a drill rig and two others unfurled a banner reading "Save Coal River Mountain" to protest Massey Energy's blasting at the Bee Tree mountaintop removal site. Residents are concerned because the blasts are 200 feet from the Brushy Fork Impoundment, which is permitted to hold nine billion gallons of coal sludge. Massey itself estimates that 998 people would die if the dam breaks. The activists said they plan to remain locked down until they are arrested. 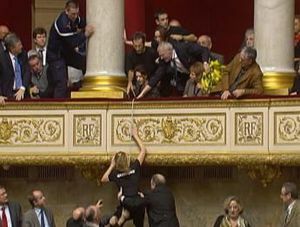 Greenpeace activists take over French National Assembly on December 2, 2009. Greenpeace activists interrupted a debate on the Copenhagen climate summit in the French National Assembly. Protesters waved banners, chanted from the guest galleries, rappelled into the area where parliament members sit. The activists were evicted, with Green Party members applauding their efforts and other officials decrying the invasion as "counter-productive" and "a violation of democracy." ↑ 4.0 4.1 4.2 4.3 Jeff Biggers, "Takes a Village to Stop Razing Appalachia: Power Past Coal Fights Back," Power Past Coal, March 12, 2009. ↑ "Say NO to Clean Coal Propaganda! BOYCOTT the Ed Shultz Show," Grassroots Grow, February 9, 2009. ↑ "Action en Mass!," Power Past Coal, March 8, 2009. ↑ "Thousands Storm Capitol Hill in Largest Protest Against Global Warming," AlterNet, March 3, 2009. ↑ "Over 300 Greenpeace Activists Arrested After Finance Ministers Blockade," Greenpeace, March 10, 2009. ↑ Juliette Jowit and Matthew Taylor, "Mass arrests over power station protest raise civil liberties concerns," The Guardian, April 14, 2009. ↑ Fasting for our Future, accessed May 4, 2009. ↑ "It's a Beautiful Day for a Banner Hang!," Greenpeace USA, April 27, 2009. ↑ "Thousands demonstrate against coal plant in Mainz," The Local, May 24, 2009. ↑ "Mainshill hosts first Scottish Climate Camp" Ross Thomson, August 5, 2009. ↑ "Climate activists blockade Rudd's office" WAtoday, June 13, 2009. ↑ "Protesters leave coal cargo ship," BBC News, June 22, 2009. ↑ "700 protest against carbon dioxide plan," Dayton Daily News, June 30, 2009. ↑ "Greenpeace Gets Badass, Drapes Pic Of Obama Over Mt. Rushmore Calling For Climate Action," ecorazzi, July 8, 2009. ↑ Jani Myer, "Greenpeace red-flags ship carrying SA coal," IOL, July 11, 2009. ↑ "Public packs Valmont power plant hearing," Clean Energy Action, July 14, 2009. ↑ "Protesting farmers blockade mining company," The Jakarta Post, July 16, 2009. 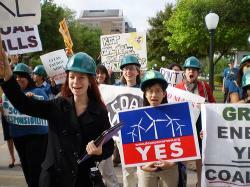 ↑ "Crowd rallies at Capitol for renewable energy," Lansing State Journal, July 29, 2009. ↑ Environmentalists to lobby at state capitol today," Lansing State Journal, July 29, 2009. ↑ "Coal protest outside council HQ," BBC News, August 10, 2009. ↑ "Climate change campaigners blockade London headquarters of Royal Bank of Scotland," Telegraph.co.uk, September 01, 2009. ↑ "Climate activists in Copenhagen protest coal use," Associated Press, September 26, 2009. ↑ "Coal protest woman: My children helped me be stronger eco-warrior" Kiran Randhawa, Evening Standard, October 27, 2009. ↑ "Five Held in Coal Protest" "BBC News UK," October 5, 2009. ↑ 70.0 70.1 70.2 "8 arrested on Kanawha Co. strip job, $16,000 cash-only bail", October 22, 2009. ↑ " Protesters stop coal ship from loading, Brisbane" "The Sydney Morning Herald, October 19, 2009. ↑ International Day of Climate Action, 350.org, accessed October 25, 2009. ↑ "Greenpeace dumps 18 tonnes of coal at govt offices" Associated French Press, October 28, 2009. ↑ Sloan, Liam (29 October 2009). "Didcot tower is 'taken'". The Oxford Times. Oxford: Newsquest (Oxfordshire) Ltd.
↑ "Activists arrested after coal mine protest," New Zealand Herald, November 17, 2009. ↑ "Protesters block Parliament's doors," Couriermail, November 23, 2009. 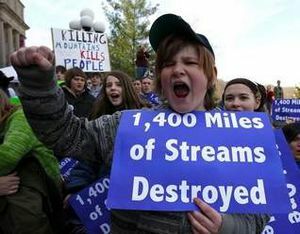 ↑ "Citizens Block Shipment fo Generator to Cliffside Coal Plant," Rising Tide North America, November 30, 2009. ↑ "Greenpeace activists invade National Assembly debate on Copenhagen," France 24, December 2, 2009. Bryan Walsh, "Taking on King Coal," Time Magazine, November 5, 2008.